Kismet's Creations handmade silver starfish necklace is $185. 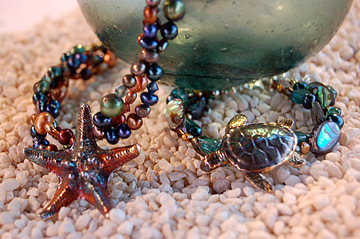 The handmade turtle bracelet is $95. Jennifer Maldonado caught the entrepreneurial bug early, when she was 6 or 7 years old. "I was making bracelets with these big, funky beads, and I'd go from door to door in the condo where I lived, trying to sell my jewelry to my neighbors," she said. "People were so nice, they actually bought them! "One woman asked me if I wanted to trade one of my bracelets for a whole box of beads, and that was it. I've loved beading ever since." These days, Maldonado's creations sell for more than the 25 cents she charged as a child, but you can chalk that up to a couple of decades of inflation, education and considerably better materials. Back then, what she had to sell was probably "fake crystal," she said. "I'm sure my mom just bought me the cheapest beads to keep me quiet." Today, Maldonado works with her husband, Rafe, under the name Kismet's Creations, making ocean-inspired jewelry out of silver with an iridescent patina finish, paired with strands of freshwater pearls, Swarovski crystals, semiprecious stones and polished abalone shell. The Maldonados will be showing their gems among the hundreds of entrepreneurs at this weekend's 11th annual Made in Hawaii Festival. The event will feature more than 400 booths offering Hawaii-made products, from clothing and jewelry to toys, home furnishings and Hawaiian crafts, such as Hawaiian war clubs by Manny Mattos of Designs by Leia. Other entrepreneurs include Pearl Ling, a self-taught artist who specializes in moolelo artwork drawn on coconut fiber, and Cindy Sugai of Wear Me Out, a line of Las Vegas-oriented good-luck apparel and accessories. 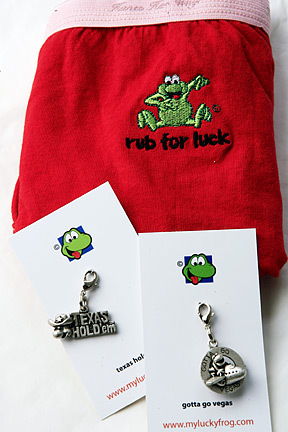 Her wares range from key chains and cell phone leashes to T-shirts and colorful undies emblazoned with cartoon images of lucky frogs. Although Jennifer Maldonado continued beading as an adult, she said it wasn't until she took a class in working with metal clay that "I exploded with ideas." The clay was easier to work with than metal, and she liked the idea that the material itself was made from recycled silver from camera film and other sources. When fired in a kiln, the clay is burned away to leave pure silver. Wear Me Out's lucky apparel and accessories will be among the Hawaii-made products up for grabs. Admission: $3; free for ages 6 and younger. Dollar-off coupons available at Oahu First Hawaiian Bank branches. Entertainment: Hoku Award-winning artists perform 1 to 7 p.m. tomorrow, 11 a.m. to 7 p.m. Saturday, 11 a.m. to 3 p.m. Sunday in the Pikake Room. "We've always tried to be eco-conscious," said Maldonado, who for six years lived on a boat named Kismet by its original owner. "Living on the water (from Santa Barbara to San Diego and now Kailua), we see a lot of pollution, because the water is where everything ends up," she said. "But the beauty of the sea inspires you to keep it as pristine as you can, so we try to make an attempt. "I don't think anyone's perfect that way, but we are working in that direction. We use recycled paper. Our boxes are made of recycled materials, and we give 1 percent of our gross sales to environmental charities." When Rafe saw how much fun she was having, he joined her in jewelry making without cramping her style one bit. "Our studio is in our one-bedroom condo, and we work side by side. We'll listen to music, sing, until we get into production mode, like now, when we get serious. And when we're working with the clay, we have to be more focused than when we're doing beadwork." Rafe has turned out to be a gifted artist who sculpted the honu and starfish forms that are at the heart of their new collection. The pieces have been hits at craft fairs, including the monthly Kapiolani Art Fest, which draws both tourists and locals. No two pieces are alike, due to a special finish and polishing that gives each piece an iridescent quality ranging from the blue-greens of the ocean to the reddish browns of the earth. "Local people like it," Maldonado said, "because when they see our honu, they know it really looks like what it looks like when you're swimming with them."